Working alongside @SSAFA @CardboardCitz @Providence_Row @crisis_uk “The ladder to success” event to bring together services from across the borough and sector in the hope of offering even more. The Whitechapel Mission has been serving the homeless and marginalised for over 140 years – and our daycentre services of food, clothing, showers and shelter are well known and documented. But, this is only part of the services provided and an important part of our work includes skills training and career advice, activity programmes and specialist support for complex needs. By encouraging each person to address the issues which caused their homelessness, we help them to gain the skills and confidence to make lasting changes in their lives. On Thursday 16th March 2017 we hosted the “The ladder to success” event to bring together services from across the borough and sector in the hope of offering even more. Working with Marina Cogan (Dept of Work and Pensions) and different agencies from within Tower Hamlets and the sector, we came together to help individuals with the tools the needed to take their next step. Thanks to DWP, Universal Credit dept, Pension dept, Crisis, Dellow Centre, Business in the Community, Beyond food, SSAFA, Cardboard Citizens, and individuals offering interview skills, C.V writing and presentation skills. The results were unbelievable and more than we could possibly have hoped for. From 10am – 1pm we were inundated with people looking for help and advice. From writing C.V.’s and getting them sent them off to different organisations, we were on the phone none stop. 6 people set up for job interviews for tomorrow alone! Fantastic. One of the men who is set up for an interview tomorrow, came in, did a C.V sat with the interview technique helper and then sorted through the rails of clothing to find an appropriate suit. 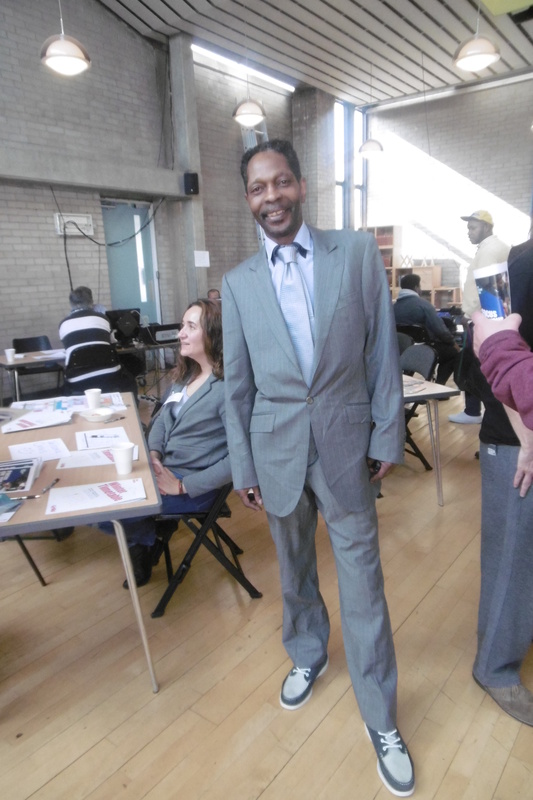 Once he tried it on to see how he would look, he came to us and said ”Wow, I didn’t think I could look like this, I feel great; I AM going to get the job. I now know how to sit properly and I’m going to smile and be confident” He looked 2” taller and the smile on his face was worth the whole days work. Massive thanks must go to Marina and her team, the representatives from some great organisations from across the sector and the volunteers who participated. A very productive day with some great outcomes. We hope to repeat this service on a more regular basis.